Theatre Fairfield’s production of David Auburn’s play “Proof”, performed Jan. 25 through Jan. 27, was outstanding–college theatre at its best. 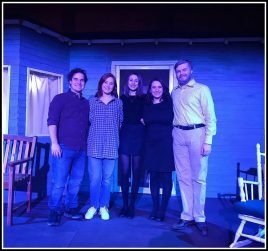 Director Shannon Kelley and the cast captured the agony, fear, and loss experienced by families facing the mental illness of a loved one and, at the same time, left the audience with a sense of hope. Special thanks to Theatre Fairfield and the Student Independent Project for donating proceeds from the production to Fellowship’s Expressive Arts program.